700km and more than 15.000 meters of elevation. I can only say it has been eight wonderful days of racing through Tropical North Queensland!! My goal for this race was pretty clear: Do better than I did in my first participation back in 2015, where I finished on 2nd position. By aiming for the overall victory everything was set for 8 hard stages battling some of the strongest riders in the world. The Swiss riders Urs Huber (Team Bulls) and Konny Looser (BIXS) were the guys that I had to beat if I wanted to win the race. We raced against each other like crazy all week. I was maybe lacking a bit of speed after a long season. I tried to follow the two guys and planning to make my move as soon as they would show any weakness in strength. But Huber and Looser never really had any big problems all week long, which made it difficult for me to try my luck. I finished in top 3 on almost every stage. During stage 4 I took a wrong turn on the track caused by sabotage of the marking of the route. After a lot of discussion with the UCI Commissaries I was “punished” with 30. My chance to win the overall was fading due to this decision. I decided to focus on day results instead. Finally I could raise my hands when winning the 130km long stage 6. Wonderful to take my first victory ever in Australia. Crocodile Trophy has been a really great season ending with a strong 3rd place overall. I really gave it all but in the end I had to be satisfied with my result. I will now enjoy some time off the bike. My plan is to be back on the cross bike for the 11th of November. I will do like the other years and slowly build up my shape for new MTB season. Normally that means that I will be in good shape by the end of the year, and hopefully I can once again go for the win at the Luxembourgish championships in cyclo-cross. For the last few weeks I have been really focused to get in the best possible shape for this race. 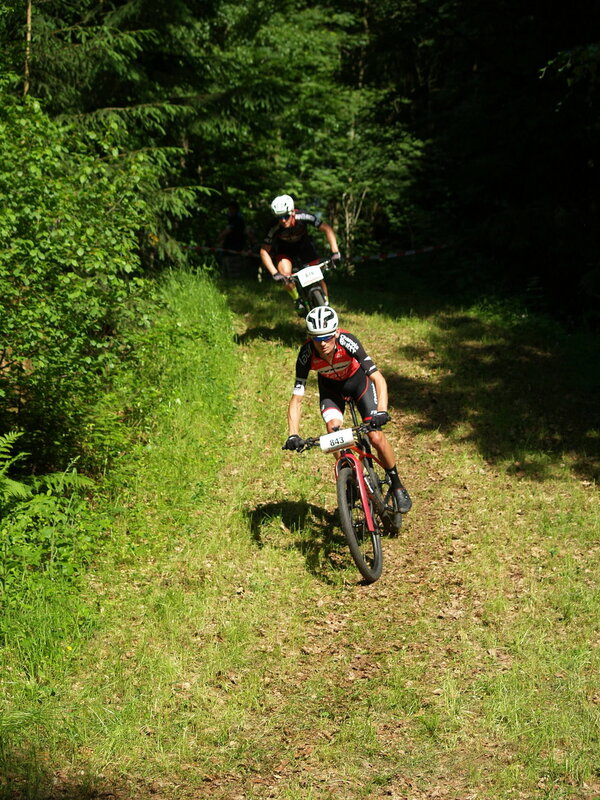 The race consisted in 75 KM and almost 2000 m of climbing on mostly single trails. Straight from the beginning I was setting the pace and could control the speed more or less like I wanted. Unfortunately in the middle of the race, my back wheel caused some problems with 2 broken spokes. In this way the final turned out a bit more exciting than I had hoped for. With 3 minutes of advantage to the second I had a comfortable lead and the victory was never in real danger. Victory at "Skaidi Xtreme" in Norway! Some good news update from the north. On Saturday September 1st, I won “Skaidi Xtreme” for the 3rd time in my career. This race has become within short time one of the most recognised events in Norway. It takes place in a wonderful and really special landscape all up in the Norwegian Finnmark. This year’s edition was more special than usual as the organisers managed to put together the absolute strongest race field in the race’s history. 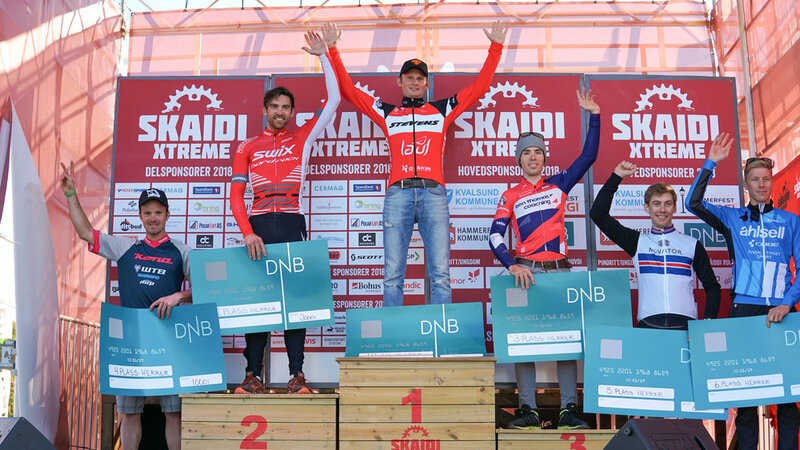 Multiple Canadian champion Cory Wallace and the British champion Ben Thomas were amongst the strongest riders, beside the very the top of the Norwegian MTB elite. The race consisted of 3 laps of each time 15 km with 1500 meters of elevation all in all. Due to the really bad and rainy weather the day before the race, the track turned into a muddy field. Racing under these extreme conditions is really challenging as this race is taking place in the most northern part of Europe accessible on a bike. The town “Skaidi” is located on the same degree of latitude as Greenland (have a look at Google;-)). Only the warm Golf current makes it possible for people to live up there. So it is really special! In order to beat all these strong guys I knew I had to come up with a really good plan and in the same time an aggressive race tactic. That’s what I did from the beginning on. Full speed and attacking every little hill we entered. Technically I am for sure not one of the best riders, but from the previous years’ experiences, I knew that the only chance to win was to make the difference on pure power. During the first half an hour we were mainly riding on a pretty flat terrain, which made it difficult for me to gain any advantage upon the other riders. After 15 km of racing we entered some more demanding terrain and started to climb the first of 3 longer hills. I followed my plan and went as hard as I could up the hill. On the top only British champion Ben Thomas could follow, but the rest of the competitors were still chasing us behind. The race was still open and only after the 2nd long climb of the day, I managed to get Ben Thomas off my wheel. I knew that I had to keep up the pace for the last 20 km, trying not to flatten or getting any other mechanical issues. Everything turned out to be perfect. After a really intense and hard race, I could finally raise my hands as the winner of “Skaidi Xtreme 2018”. This was my 3rd event during my career. It was such an amazing atmosphere at the finish area as so many people came to watch this great event on a sunny day. It was again an unforgettable experience. Here a little update from the past summer weeks for those who did not follow me on my social media account. It was really exciting and busy time with a lot of travelling, nice memories and good results. In the beginning of August I finished at the 5th position at the UCI Marathon world cup “Montafon M3” in Austria. I stayed in Austria to race the UCI 3 days stage race “Ischgl Iron Bike” the week after. I finished on the 6th spot in the overall classification. End of August I travelled to Nebraska USA to participate in my first ever World Championship of Gravel Racing. After 250 km I proudly crossed the finish line in 7th position. The gravel sport has really gained a lot of popularity in the USA and I am sure that it’s just a matter of time before this discipline strikes Europe! In the upcoming weeks I will be racing in Germany and Belgium. This will be as preparation for one of my big goals this year, the Luxembourgish MTB marathon championship on the 6th of October. Luxembourgish National Champion Cross-Country 2018!!! I spent my weekend racing my first cross country national championship ever in Luxembourg, the country I have been representing since the beginning of this year. I had this race on my mind for the last few months and have been preparing really intense for making a good result on this particular day. I managed to reach one of my biggest goal for the summer by winning the Luxembourgish elite MTB cross country championship in Alzingen. This has for sure not been an easy challenge as I have spent hours and hours to get the top speed back in the legs for this race. As you know my main discipline is marathon and the training is a lot different than the training for the short track Olympic discipline. So the last 6-7 weeks I have been trying to improve the speed in my trainings. I did motor pace training behind a scooter for 3-4 hours combined with a lot of super intense short hilly intervals a few times a week. I knew that the track of this year suited me really well and it was only a matter of getting in front of the fast guys who normally win the cyclocross, MTB and road races here in Luxembourg. The championship on the 21st of July was held on a super difficult track with a lot of turns. There was a 700 meter long hill we had to get up 12 times. I was training a lot on the track in order to know every little corner, stone, root, hill etc. The start of the race was really fast like always in cross country. During the first few laps I was fighting to get near the front, which took me like 4-5 laps out of 12, as I am a bit of a slow starter. From there on it was just full gas where I tried to make the remaining laps as hard as possible for my opponents. We were racing with high speed and it took me all in all 60 minutes to get rid of last guy Felix Schreiber, who finished 2nd at the cyclocross nationals back in January. After 12 laps of racing I could finally raise my hands and I knew it was my day. I won the race 2 minutes in front of Philippe Bützow and Scott Thiltges, both really strong cyclocross riders. I am super happy with my victory and how things worked out. Now I will be wearing this beautiful jersey in all cross country events from now on and during the whole next season. The upcoming weeks will be really tight scheduled. This week I leave to Austria to race the UCI world series race “Montafon M3” on Saturday the 28th July. The week after I participate in the UCI S2 stage race “Ischgl Ironbike Festival” which takes place from the 4th-6th August. After Austria I will fly directly to the US (Newbraska) to do my very best to fight for the world champion jersey in Gravel Racing at the “Gravel Worlds” on the 18th August. I will of course keep you updated about these events, and you can follow me on my social media accounts. A little update from last Sundays race in Einruhr in Germany. Like always in German races the pace was high from the beginning. So after the first hour of the race the front group was cut down to just 10 riders. We rode together like that until km 50 where Robbert Mennen thought it was time get the “party started”. Only Bas Peters and I was able to follow this pace and we rode together until the last 30km of the race. I felt really strong on this day even after almost 2000m of climbing, so I decided it was time to try and attack the others. –There was no way that I wanted the race to come down to a sprint finish as I would for sure not win the race like that. So I attacked on the hardest climb on the track. In the beginning I could not get them of my wheel. So I had to continue this crazy pace for another 7-8km before I could get a gab to Peters and Mennen. -But like I said, I felt strong and I could hold a nice gab until the finish line where I could raise my arms as winner of the race. This was a super nice day for me and a good test before my really big upcoming goals in July. I feel like my shape is good at this point. –I have been doing a lot of hard work and now I can only hope that it’s good enough for the upcoming BIG events. Last week I got some more good news. In October (13-21) I will once again be starting at the biggest MTB event in Australia, the UC S1 stage race the “Crocodile Trophy”. This year I want to come back to improve my 2nd place from 2015. I believe this is a really nice race to end the season and there is always a huge media coverage from the event. A short update from Luxembourg. Last Sunday 27-05-2017 I won the “Überwald Bike Marathon” in Siedelsbrunn, Germany. A really nice race on a fast track consisting of 3 laps of 25km with each 500 meters of climbing. So a total of 75 km and 1500 meters of climbing was on the menu. Like always the races in Germany are super-fast and the start even faster…- like there was no tomorrow! We started uphill for the first 2km and with a super high pace. After the first lap we were only 10 guys left in the front. With temperatures around 30 degrees and a high pace I knew it was only a matter of time before the other riders would start to crack. So the first lap was all about keeping focus and try to stay hydrated before the final. In the middle of the 2nd lap Sascha Starker from BMC Germany attacked on a hard climb and I was the only one who could follow him. We worked together until the beginning of the final lap where I attacked on the hardest climb of the day. I had to do this as Sascha is a really fast guy and normally races cross country. -So no way that I wanted to drag him home to a sprint finish. I got a gab immediately and could fast make some distance to Sascha. I finished the race as winner in just below 3 hours of racing and almost 5 min advantage to the 2nd, Sascha Starker. Really nice with this victory on a HOT day and good training here one week before one of my big highlights of the season. This upcoming Saturday I will race in the US in Kansas at the gravel race called “Dirty Kanza 200”. The race is 200 US miles which means around 330km. In the US this discipline is really booming in the moment and I am really looking forward to try out this new adventure. For me it’s important that I every year not just to do the same thing again and again. The preparations and expectations for this event has really given me a motivation boost. I will keep you updated about the race via social media. In the beginning of June I will take it a little “easy” with less travelling and then build up my shape for the national championship in cross country in Luxembourg. This title really means a lot to me and I will do everything I can to be in super shape for July when the start goes. A little update from the UCI cat. S1 stage race 2018 “Belgian Mountainbike Challenge” (BeMC): 3days - 260km - 8000m+ meters of climbing. A very big highlight of my season was to go back to “La Roche-en-Ardenne” (Belgium) to fight for glory in this super nice event. I won the race already back in 2015 and ever since, I have been on the podium on the following year’s editions. That’s why I was also among the big favorites for the overall victory of this year’s edition. The race is high ranked and categorized as an UCI S1 event. Some really strong riders signed up for the race: Christoph Soukop from Austria and multiple Belgian MTB champion Frans Claes. Other big opponents were cyclocross star like Laurens Sweeck, Quintin Hermans and Wietse Bosmaans. Stage 1: 84 km – 2450 meter of climbing. Already from the beginning I knew that it will get really though the next days. I planned to make already a good result on the first day, in order to get into the lead of the race. After only 40 km of racing, only 10 guys were left in the front. As the race was really fast since the beginning and I did not feel perfect, I decided to wait. Indeed the final last 20 kilometres consisted in almost 1000 meters of climbing. When we entered this part I knew it was time to make a move. In the beginning only Laurens Sweeck and Frans Claes could follow me. Finally I got rid of them on the next climb with 15 km left to go. I did a solo ride to the finish and won the first stage with more than 1 minute advance to Robbert de Nijs. Great start and great feeling to wear the leader’s jersey during stage 2. Stage 2: 100 km – 3050 meters of climbing. This stage caused me most difficulties. This stage was really demanding and comparable to a 100 km long cross country event with a billion of turns. In the beginning I still felt good, actually a lot better than expected. Towards the end of the stage, I was still in a 5 man front group. Suddenly, old cross country star Christoph Soukup from Austria attacked. At this point I could feel I had to slow a little down in order to safe some energy for the last stage also. Soukup dropped me during the final kilometres and I finished in 2nd position. Fortunately I could maintain my overall lead. Stage 3: 67 km – 2300 hm. According to the classification, I was leading 3 minutes in front of Soukup. As you know 3 minutes advantage turns out to be nothing when you have a bad day or a mechanical problem. Already in the early morning we faced difficult weather conditions: it was raining enormously coupled with temperatures below 10 degrees. As I felt really good since the beginning of the race, I stayed easily in the front group all day long. The track was really heavy from all the rain and I could see my worst opponents starting to suffer in the mud. Towards the end of the stage I started to set a high pace. First Sweeck had to drop, then De Nijs, and in the end it was just Frans Claes and me left in the front. With only 10km to go I attacked with all power on a steep climb. Claes had to let me go. I raced solo until the finish where I could raise my arms as the winner of the stage and the overall winner of the BEMC. Although I knew from the beginning that this year’s edition would be very difficult due to all the BIG names, I managed to win BEMC for the second time in my career. As the race has become really important and big in the Benelux region, there was a big interest from the international media (Dutch and Belgian TV and Eurosport Benelux were broadcasting from the event). Some amazing report from this great event will broadcast on Eurosport 1, Thursday May 17th at 22h00 and Sunday May 20th at 10h15!! A little update from last Sundays season opener in Germany in Solling (Hellental). Finally we got the XCM season started in Germany. The “season warm up” as the organizer call the race was held on really hilly track consisting of two laps of 34 km with a little more than 1600 meters of climbing. So all in all a good race to start out with: not too long, not too short! I knew before the start that the riders to look out for were the cross country guy`s from German Team “Rapiro-Focus Racing Team” as the race was held on their home ground. Another strong rider to look out for was Peter Hermann from the big German team Centurion-Vaude. Like always in German races the pace was super high from the beginning. So after the first lap we were left only 5 riders in the front group. I felt really strong on this day so as we went out on the 2nd lap it was time to make my move, and I attacked on the hardest climb on the track. I got a nice gab to the rest of the group and from there on I put a high pace until the finish line. This was a super nice day for me and a good test before my really big upcoming goals in April. I feel like my shape is good at this point of the year. –I have done all the hard work and now I can only hope that it’s good enough for the upcoming BIG events..
Next weekend I will race the European championship in XCM in Italy “Tiliment Marathon” which is also my first time representing my new nation Luxembourg in an international marathon race. Today I raced the season opener in Belgium, the MTB marathon “La Grande Hallonienne”. 75km and 1900 meter of climbing. -A really hard race to start out the north European season! Big stars like Mathieu, and David Van der Poel was amongst the riders to beat in this year’s season opener in Belgium. -Rain and cold was on the menu! –I knew that even before the race! After only 20 km of the race we were only 3 guys left in the front, Van der Poel, Joris Massaer and me. We raced like this for another 15 km before I had to drop the group after technically problems. –-A piece of metal wire got stuck in my back wheel, and I broke 2 spokes.. I was chasing like a crazy to come back to the front, but in the end I had to be satisfied with 2nd position, less than 3min. after Mathieu Van der Poel. Having in mind all the work and training being done in the last few weeks, I can only be satisfied with this result. Like I told you last time, the month of February and March has been spend riding a “billion” of KM`s on the road in order to get ready to the MTB season kick-off here in Northern Europe. Today’s race in Belgium showed me that I am on my right way in order to reach my top shape for the important upcoming events. Next week I will be racing the “Warm up Marathon” in Solling, the season opener in Germany. After this race I have the European championship in Italy, before the UCI XCM Series “Roc d`Ardenne” the week after. From here on the season is running more or less until October. Thank you all for your nice greetings after the race here at Lanzarote!!! I had a super nice week with some great racing on the volcanic island of Lanzarote at the UCI Stage race “4 stage MTB Lanzarote” Pwb Club La Santa! Best of all was to proof that all the hard work this winter has payed of and that I am already now on a really high level for when the season starts in northern Europe! Like you know I ended up on the 2nd place overall after Spanish Cross Country star Sergio Mantecon (Trek Factory Racing) The last spot on the podium went to Austrian XCO Champion Karl Markt. Actually this was the exact same overall result as in 2017, so that is a good indication of the start of a new great season. 55 sec. was all I was missing in order to beat Mantecon, and that after 4 days of hard battle on the rocky island of Lanzarote. But I think we gave a great show to the spectators and the organisers of the race. Every day people was telling me how they would race if they were in my position, so that was quit fun. During the 4 days of racing I and my team tried all we could to get Mantecon “off” the podium, but in the end he was just a little too strong. I knew I only had two chances to beat Mantecon: Stage 1 and 3. The rest of the stages was simply impossible to ride away alone due to the wind and not much climbing. On stage 1 I attacked like a crazy and actually I got almost a minnute gab to Mantecon and the rest of the guy`s. But in the end the 42 km alone in the super windy conditions was to hard to ride all alone. I finished the stage in 2nd position but still 7 sec. in front of Mantecon. Stage 3 was like every year a 50 min. time trial. I had really hoped that the wind would be less on this stage, but instead we had like crazy storm on the whole stage. On this stage I came in 2nd again around 1 min. after Mantecon. I knew this was my last chance if I wanted to win, so on stage 4 there was nothing else to do than execept my 2nd. position in the overall. We had a great week at Lanzarote and all the guys I invited with me to Lanzarote did all they could to help out for a good overall result. Special thanks to Christian Pfäffle(GER) (Stevens Racing), Gerben Moss (NED), Greg Saw (AUS) and Bjarki Bjarnasson (ICE). The race this year has been signed up as UCI stage race event which counts for the UCI Cross Country ranking, means that all the best riders from Spain, Portugal etc. had found their way to this event. All 4 stages was raced with a super high pace and sometimes it made me think back to my road days. Every day was a fight to stay in the front on the small and narrow roads, but it worked out every day and I believe I have to be happy with my 2nd overall. After my national cyclo-cross champion title in Luxembourg and all the winter cross racing, I think it is good to focus for some weeks on proper quality training in order to be at my best level for when the season starts for real in northern Europe. Review from Spanish TV of the 2018 "4 Stage MTB Lanzarote"
All for now!! -See you around!! Hope you had a nice weekend!! Luxembourgish Cyclo-Cross Champion!!! I spent my weekend racing my first ever cyclo-cross national championship in Luxembourg, the country I will represent from now on. 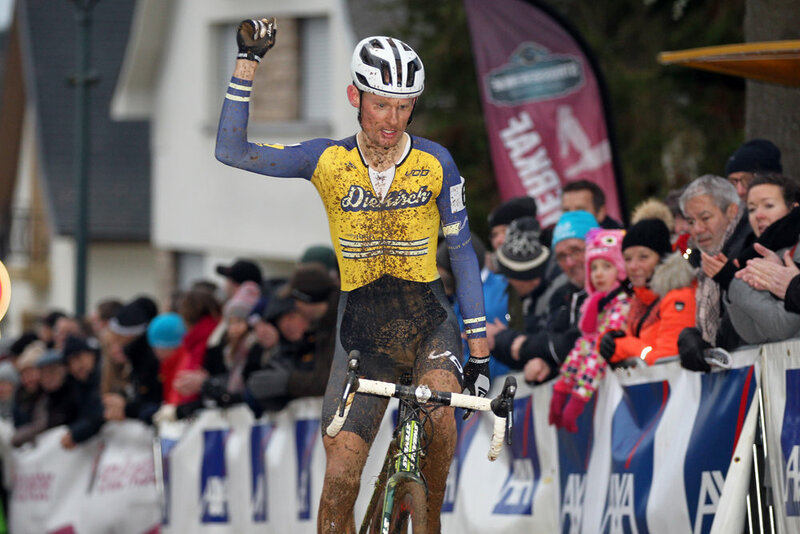 -It was amazing winning the Luxembourgish elite cyclo-cross championship in Kayl. I managed to reach my big goal during the winter. I started with the first cross races in the middle of November after 2 weeks of break from the bike. My performance level was not that good in the beginning. As the days and weeks went past I always got stronger and stronger. In the middle of December I was up in the top 5 ranking in most of the races. All though I was still missing the last power to reach a victory. In the beginning of January I started to feel really good in training. The championship on the 13th of January was held on a super difficult track with a lot of turns, small hills and an incredible inferno of mud. I was training a lot on the track in order to know every little corner, stone, root. The start of the race was really fast like always. As I do not have many UCI points in Cross I had to start in the middle of the field. I had to change my bike in each of the 9 laps. Thanks again to my team and helpers. The first few laps were one big fight. First I had to catch up with the first riders until I got there after 5 laps. From there on it was just full gas where I tried to make the last few laps as hard as possible for my opponents. We were racing like crazy and only in the very last lap I got the last guy off my wheel. I could rise my hands and I knew it was my day. I won the race 5 sec. in front of the 2nd (and winner of the U-23 ranking) Felix Schreiber. I am super happy with my win and how things worked out already in the beginning of the new year. I will be wearing this beautiful jersey in all cyclo-cross races during the whole next season. On Sunday I will leave for Lanzarote where I race the first MTB stage race of the season, the UCI S2 “4 Stage MTB Lanzarote”. I hope I will be ready to fight for the overall title, as I finished 2nd last year and also won back in 2015. After Lanzarote there will be a little break before the season starts for real here in northern Europe. Stage win at "Brasil Ride"
Hope you are doing great out there!! I am just back from the last MTB race of the season in Brazil. “Brasil Ride” is the biggest stage race event in America and worldwide recognised as one of the hardest races to win. Winning this race was something my team mate Luis Pinto and me were aiming for. 7 days • +600Km • +13.000M were waiting for us! –And not to forget, the heat and the burning sun in that country were maybe one of the biggest obstacles when you come oversea from Europe. But nothing went like we had planned and hoped for. While test riding the track for the prologue the day before the race, Luis hit a sharp metal piece in the narrow single trails and got a 10 cm long open cut in his right leg. First I thought he was joking when screaming for an ambulance but when I had a closer look the leg was open right to the bone.. Somehow we got him fixed (8 stiches) and I somehow convinced him to start the prologue the day after, just to try and finish and then maybe look ahead to the 2nd part of the race. So did we: we forgot about the overall classification and tried to get as easy through the first stages as possible. Queen stage 4 was the hardest and most brutal stage of all. We decided to go all we could trying at least to compensate all the bad luck. We were both super happy about this win and the way we did it. We showed everyone that on a “normal day” we would have been on top with the leaders in the final overall. The day after, we nearly won another stage. Unfortunately we got caught in the end, and finished the stage in 3rd position. The rest of the stages we were doing well but Luis started having problems with infection in his leg, so we had to slow a little down. But all in all I think we got the best out of the situation even if we both knew we could have done much more if things had gone our way. Now I am back in Luxembourg where I will take a week or two without the bike in order to recover well before I start the cyclocross season. From there on I will start building up towards the new MTB season. Coming up next, Brasil Ride!! The fall has come to Luxembourg and the MTB season is getting to an end here in Northern Europe. For me this doesn’t mean it’s over yet, because next week I am leaving to Brazil to race the BIG UCI cat. 1 stage race, “Brasil Ride”. This event is going to take place from the 15-21 of October and will be my last race this season. Brasil ride has grown to be one of the 4-5 biggest MTB events in the world and for sure on many MTB riders’ “to do list”, so I am really excited to finally be a part of this great journey. I have been racing without any big brakes since end of January and of course the body and head start to feel a little tired, but newer the less I still feel really motivated and ready for this last big event of the year. I will be racing in a double team with my friend and multiple Portuguese champion Luis Pinto with whom I also won “Vuelta Ibiza” earlier in May this year. After Brazil I will for sure take a week or 2 without bike in order to recover, but also plan the last details for the new 2018 season. I can already tell now that I have many new cool plans and ideas for 2018 and I will of course inform you about in good time. Most of my MTB colleges now “hang up the bike” for some months, normally October until March or April where they start racing again. I on the other hand don’t really like the long winter break away from racing and I will stick to my plan to reach a high level in cycle cross races during the winter. I aim for a medal at the national championships in January 2018. I hope you will follow my racing in Brazil and I believe in a great result!! I am now finally back from a great race adventure in Costa Rica. More and more race organizers contact me every year to hear if I would be interested in joining their event. This year I thought it was time for something new and I went to Costa Rica where I started in one of the biggest MTB events in Central America. The race “160 Rincon de la Vieja” is like its name says, a 160 km race on and around the still active volcano Rincon. This was my first time racing against the south/central American riders. People told me in advance that the level is really high. The big teams from Costa Rica are sponsored by the big brands we also know from Europe, like TREK, FOCUS, Specialized, PIVOT, Cannondale and so on. The race started at 5.30 in the morning just as the sun rose. Instead of starting “easy”, as I know it from the long XCM races here in Europe, we went with full speed right from the very beginning. Actually I felt a little like “WTF am I doing here”, but then I remembered the organizers’ words: the guys here in Costa Rica will probably do everything to scare you from the beginning and probably go like crazy from the first meters. So I saddled up and just focused on staying in the top 20 as we hammered into the first part of single-track through the jungle of the rain forest. After the first hour we were still racing a crazy high pace, and I knew I could not do this for 6+ hours, so I had to let the first guys go. Another hour passed by and slowly I could start catch the front guys back. After 90km, I could see myself all alone in the front of the race still knowing that I had more than 70 km to go. I managed this with help from my “team” as this race allowed each team could be followed by car or quad. So I had my private quad-team helping me through the whole day until I finally after 6 hours and 27 minutes crossed the finish line as the winner of this great event. 2nd became Jonnathan Carballo from PIVOT Factory Racing, 3rd Allan Morales from Team FOCUS. After some difficult weeks with not much luck and a lot of technical problems during the races, I’m really happy that things now go my way like they should! Now I hope for a fast recovery to be ready to fight for my 3rd national champion title at the national championships in Denmark next week. Here in Luxembourg everything is going well. The month of July has been super busy for me as I spent time on moving into a new house. I am super happy to finally move in, but it is also something I just want to get over in a hurry. I have been doing my training program as usual, but I could not take me the normal time to recover after the hard training sessions this month. I have done my training and I am pretty sure this will pay off during the 2nd half of the season. Besides all the moving around I have still been doing some big races, and even if I sometimes had the feeling of being more tired before the races than after it has actually been going okay. I could win a nice victory at the Erbeskopf marathon in Thalfang Germany (9.07.2017) which is just an hour away from Luxembourg. The race was 110km long with 3250 meters of climbing, so a really difficult one, but also a great event to prove if the shape is okay. Some really good riders have signed up for the race, amongst the ones to watch were the two Belgian riders, Kevin Van Hoovels and Joris Massaer. As the race went on, the selection started as usual and one by one the front group was cut down. After 70 km we were only 3 guys left in the front and of course the usual suspects as I mentioned before. At this point of the race another factor started to play in the game: this Sunday turned into an inferno due to the heat with temperatures between 30-35 degrees. Due to the climbs this was something you could not ignore. The group stayed together until 10 km to go where I launched my final attack. I knew it was all or nothing as I started to cramp due to the insane heat. But my attack succeeded and slowly but steady, I could open up the gab to Joris Massaer. I could raise my hands for the victory in Thalfang after 3h 40min of racing, already for the 3rd time in a row. This last Sunday I took the 5th place at the UCI World Series in Austria, Montafon M3. As I have mentioned before, July has not been super easy for me. Nevertheless, I am happy with this result even if I know that I normally would be up there for a better spot. This upcoming Sunday I will be starting at the European championships in Slovakia and I hope for a good result over here. August will have other great races, as for example the legendary race in South America, Costa Rica “Rincón de La Vieja 160K” which is the biggest 1 day XCM event in South America. I will of course keep you updated. After this event I will fly directly to Denmark in order to participate in the Danish national championship. It will also be my last chance to win this particular national jersey, as I will change nationality for next year and from there onwards I will be starting in the Luxembourgish colors. Finally back from San Marino after a great week! Last week I participated in the Games of the Small States of Europe (GSSE) in San Marino representing Luxembourg, the country where I have been living for 6 years now. This race has been one of my BIG targets for the season. This was a very special experience for me, as the “games” are really important for Luxembourg. Even if I still have the Danish citizenship, I had the honor to participate in this event as I fulfilled all the conditions for foreign athletes. Friday, the 2nd of June, I lined up in the Mountain Bike cross country race where I took the gold medal in front of the Cyprian rider Andreas MILTIADIS and the rider from Andorra Guy DIAZ GROLLIER. After a crash in the second round out of six, I managed to come back to the front of the race. After the third round I set myself in the head of the race and finally won 2 minutes ahead of all the other competitors. As I applied for the double citizenship (Luxembourgish/Danish), I will be representing my new country Luxembourg in sport from 2018 onwards. Due to UCI rules concerning the world championship I have changed my racing plan for June and July. According to the rules I am not allowed to participate in the worlds in the year of nationality change. This race in San Marino was also the completion of the first part of my season which started already in January this year. Now I will have a week or two without any races before I attack the second part of the season from July until November. Those who followed my racing via social media also noticed another really nice victory at the “Les Cimes de Waimes” Marathon Belgium (25-05-2017). This race was a super nice warm-up for the event in San Marino. I won the race in front of the Belgian riders Joris Massaer and cyclocross world class rider Klaas Vantornout. Now I will take some easy days of training in order to recover and to be ready for the big events and races coming up later this summer! A little update from the UCI cat S1 “Belgian Mountainbike Challenge” (BeMC) 2017: 3days - 260km - 8000m+ Meters of climbing. One of the very highlights of my season was to go back to “La Roche-en-Ardenne” (Belgium Ardennes) to fight for glory in this super nice event. This year the race took the highest ranking in MTB stage racing, categorized as an UCI S1 event. 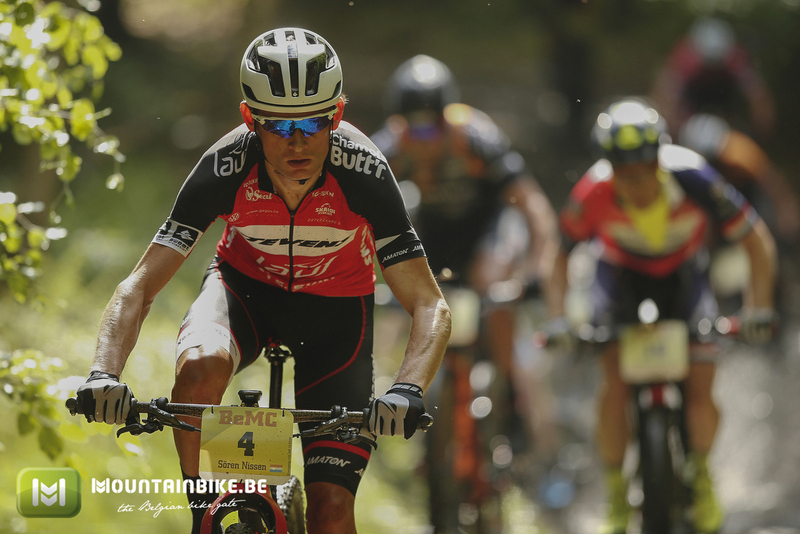 Most of the world’s best XCM riders have signed up for the event, among them the current world champion Tiago Ferreira from Portugal and former cyclo cross world champion and off-road superstar Mathieu Van Der Poel from the Netherlands. Especially due to the participation of Van Der Poel, this year’s event had huge interest from the international media. Both Dutch and Belgian TV and Eurosport Benelux were following the event. Eurosport will transmit a report from the event on Wednesday 17th of May (just before the Giro d`Italia” transmission) –So check it out! Knowing from the beginning that this year’s edition would be very, very difficult with all the BIG names on the start list, I managed to do well. On stage 1 I was the only one to follow Van Der Poel for the most of the race. Only in the very end of the race he got me off his wheel and won the stage 40 sec. in front of me. Against a guy like Van Der Poel I can only be happy with that!! Stage 2 was more difficult for me with some smaller technical problems. I ended up in 5th position, still hanging on to overall podium. Stage 3 was all or nothing for me! I felt really good and stayed in the front group all day. With only 30 seconds of advantage to the world champion Ferreira I knew that I had to fight like a crazy to hold on to my 2nd place in the over all. As the stage went on, we were fewer and fewer in the front group. With 30 km to go even world champion Ferreira had to drop from the high pace. So now we were only 3 guys left in the front: Van Der Poel, the Dutch Champion Hans Becking and me. I tried all I could to get them of my wheel and put a crazy pace for about 15 km. Becking was dropped at a point, but I simply could not get Van Der Poel of my wheel. We slowed a little down in the front and Becking came back. We raced like this more or less until the end of the stage where I had to let the two guys go on in a technical downhill. The two came into the finish together with Becking as winner. I followed shortly after in 3rdposition. The most important for me was that I managed to secure my overall 2nd place after Mathieu Van Der Poel. Current XCM champion Tiago Ferreira took the 3rd place. Here a link to the full report of the Belgian Mountainbike Challenge (BeMC) 2017 powered by Specialized made by Motomediateam. Super nice video by the way. I am now finally back from the 17th edition of Vuelta Ibiza in Spain, and it is time for an update from the race. This event could not have been any better for our team, as we won the overall classification of the 17th edition of this race. Like I told you already before the race I had a really good feeling that we would make a good result, and my good friend and partner for this race Luis Pinto felt the same. We were really strong and riding on the same level every stage. In these kind of events you need to be super strong, avoid any accidents and ride steady together. All this we did to perfection, and after 3 days of really HOT racing, we could celebrate our victory. We finished 2nd on the first stage, winning the long stage 2 where we also took so much time in the overall that the victory was almost sure. On the last stage we were controlling the race in the front the whole day, and in the finish we were happy with the 3rd place. But more important was that we could celebrate the overall win with manners on the last few meters of the race. In the overall we won in front of the Italians from Wilier Factory Team and the biggest Spanish MTB team, MMR Factory Racing Team, which consists of some of the worlds very best cross country riders. This result for sure gives us confident for the upcoming races in the spring. I am super happy for this result which has really given us a lot of publicity in Spain. Now it’s time to get ready for the upcoming races in April. Next Saturday the 22nd of April I will take part in a gravel races in Great Britain. Gravel racing is the new upcoming discipline in Europe. In the US it has already been booming the last few years, and for sure it’s just a question of time before it really “strikes” Europe. UCI "4 stage MTB Race Lanzarote 2017"
Like you know I ended up on the 2nd place overall after Spanish Cross Country star Sergio Mantecon (Trek Factory Racing) The last spot on the podium went to Austrian XCO Champion Karl Markt. I and my team tried all we could to get Mantecon “off” the podium, but in the end he was just a little too strong. We had a great week at Lanzarote and all the guys I invited with me to Lanzarote did all they could to help out for a good overall result. Special thanks to David Horvath (Stevens Racing), Luis Pinto, Greg Saw and Otto Solberg. Again thanks to all of you!! See you around!! I hope you are all well, here a little update! As you all know I had a serious crash in a race in October (Red Rock Challenge). A smaller fracture in my right leg engendered a verdict from my doctor of 3-4 weeks off the bike. Such a long time with crutches back home was for sure not the “vacation” I dreamt of after a hard season. Anyway, I gained time to set up my racing deals for 2017, which takes a lot of time too. So I already planned my season mentally! Thanks for all your messages; this was a pleasant joy. After only 3 weeks of recovery I was back on the bike with only minor pain. After another week without pushing too hard I was still following my doctor’s advice by taking things step by step. Now 6 weeks after my crash I actually feel no more pain and my leg is well. I am back on the road bike doing the kilometres and hours that I have to do at this time of the year. I am glad that all went fine. Normally I also use the winter time to race some cyclo cross races in order to improve my fitness and strength, but also my technical skills. This is very important for preparing an upcoming MTB season. I will also start doing some cross races very soon but I will have to start a little easier as I am used to. I will combine long distance trainings on the road with some more intense cross races in the weekends. Soon I will be back with more cool news about races and a new designed race outfit for 2017!